That's 2010 in review- I hope you enjoy it! 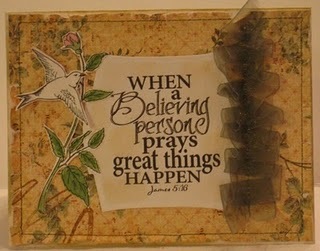 Here's hoping you have a Blessed 2011! 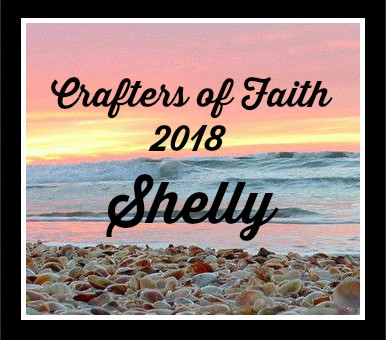 If you want to stop over to the blog post and check out the other Papercrafters posts, here is the link for the 2010 Top 10 posts on your blog . I always enjoy seeing the creativity and trends throughout the year. Thanks for all of the bloggers that stopped by and left comments! Merry Christmas to all of my Blogging Friends! We enjoyed alot of family time yesterday and today. We attended Midnight Mass (at 10:30PM) and exchanged gifts last night when we came home. We spent today relaxing and enjoying more family time. 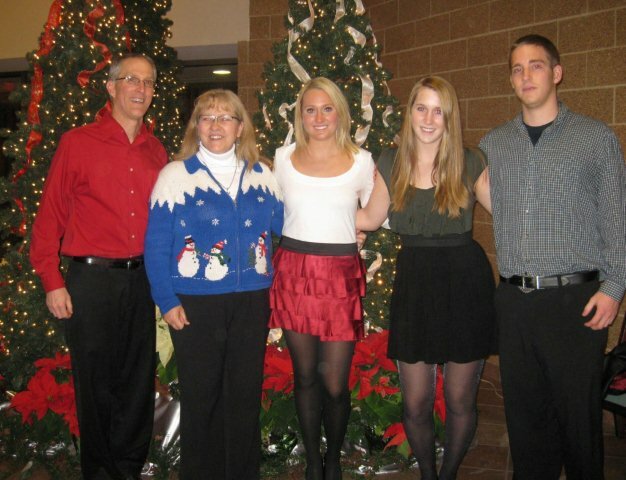 I hope all of you had a wonderful and Blessed Christmas! Creative Inspirations Paint- Thinking of You and a Tag Box- My Farewell post. 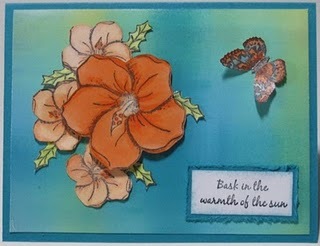 This is my last posting with the Creative Inspirations Paints DT- I have really enjoyed this DT and LOVE the paints! If you happen to see a DT call- I highly recommend it! I enjoy the images SO much at McMahon Five Designs that I have applied and accepted a position for the DT for the Jan-March term! I am very excited and I hope you will stop by to see my weekly posts. I colored the tags with Copic Markers and/ OR Creative Inspirations Paints. 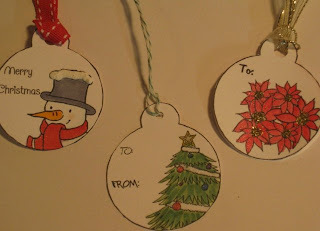 The poinsettias are Garnet CI paint, the tree has Silver, Blue, Red and Purple CI paint, the snowman is colored with Copics and I used Fairy Dust CI paint. I used Liquid Applique on the beard and mustache the snowman hat, and stocking. For the Poinsettia tag, I rotated it 180 degrees on the paper, and left open cardstock on the opposite side so I could fold the tag and write on the inside. Once it was printed off, I scored a line right at the top of the tag and folded the cardstock, then cut the tag out two layers at a time. 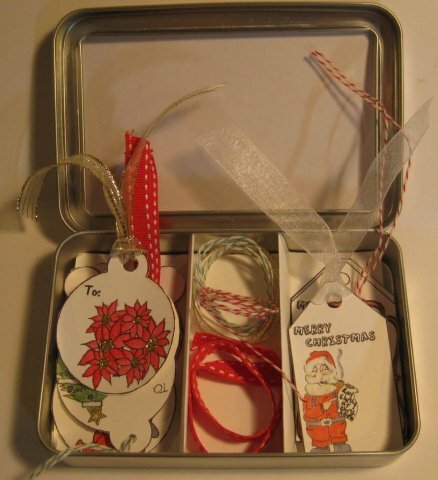 For the inside of the box- the measurements with vary depending on your tag box. For my box, I made a template with copy paper first. I cut my cardstock 8" long x 3 3/8" wide. I scored at 1 1/2", 2 14", 3" and then turned the cardstock around to score the other side- my round tags are a touch larger than the Santa tag, so I scored the second side 1 7/8", 2 5/8" and 3 3/8". This will leave a center section for tags or ribbons/fibers. This would keep little ones busy for some time- I would print the tags out a touch bigger and ....enjoy a little bit of peace! The Belli Girls challenge today is Christmas and the DT has some great eye candy on the blog to wish everyone a Very Merry Christmas too- and a Wonderful Holiday for those that do not celebrate as well. Thanks to all who choose to play along with the Belli challenges throughout the year! 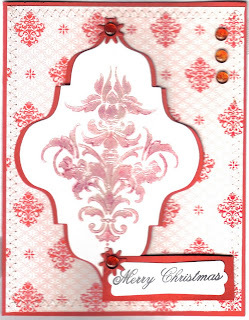 My card uses a digi by Firecracker Designs by Pamela. The background uses a Technique Junkies Technique called Faded Texture. 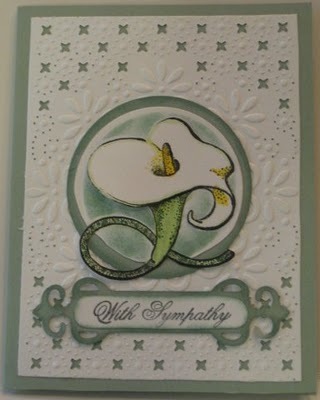 I used Distress inks Tumbled Glass and Broken China on my card. The image is colored with Copics. Don’t forget my BLOG CANDY! (Thru Sunday). Are You Ready for Some Football Chicago??? And some Blog Candy? Well, ready or not, the Chicago Bears will be playing in Minnesota vs the Vikings- at the University of Minnesota stadium. Bear Down Chicago Bears!!! We'll be cheering you on from our nice warm cozy home......! 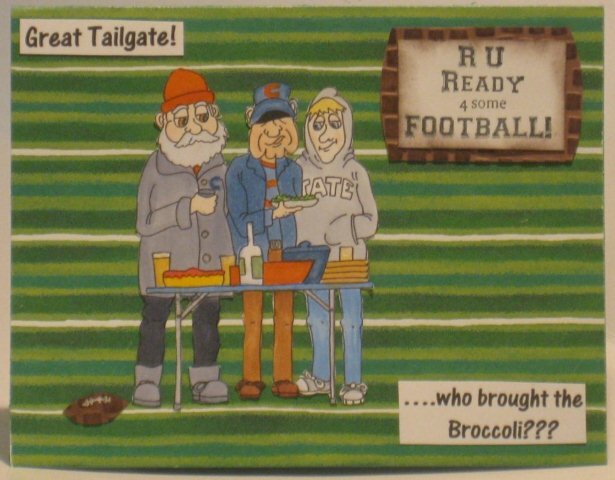 Well guys, I found this fun Digital Image at Boni Bleaux Designs- LOL My husband went to an all guy tailgate and NO ONE remembered the broccoli or the carrots......imagine that.....what would they do without us girls keeping their diets well rounded and not all pizza, beer and chips??? The sentiment is made on my computer- the Rt upper corner Sentiment is from FCD. 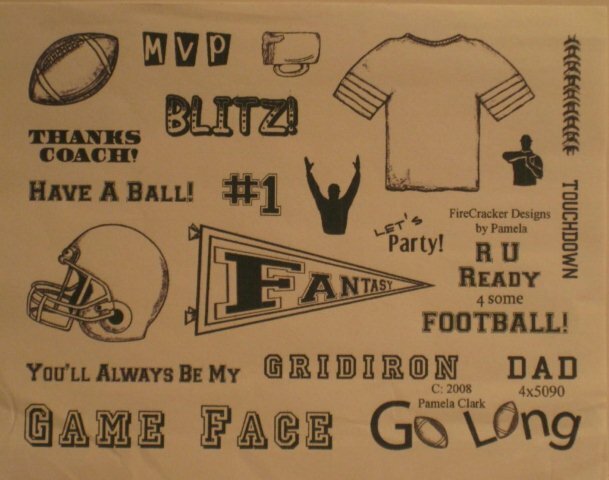 How would you like to WIN some Football themed stamps? I have a set of unmounted red rubber football stamps for you- just leave a comment - I will use Random.org to pick a winner next Sunday 12/26/10. 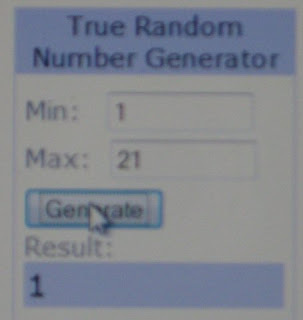 Winner, please check back and get back to me within 48 hours. 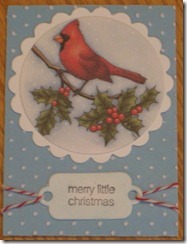 The stamps are from Firecracker Designs by Pamela- now closed and they are no longer available. My daughter asked me to make her a card to send to a Sorority sister-she is a Chi Omega and their mascot is an owl. Well, I just saw the cutest owl digi by Nana Vic- perfect for a card for her. The big wooden owl outside of the sorority house is brown, so I made a brown version for her. Then, I made a gray version- she likes the brown one better- but now I have one more card to mail….. I colored the images with Copic markers- in the ornament are the initials for her school- too small for the camera to pick up. 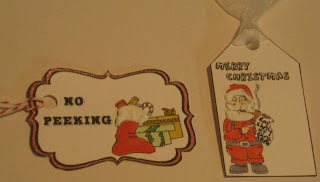 I highlighted the ornament and the letters with a Copic Spica Pen to add shimmer. 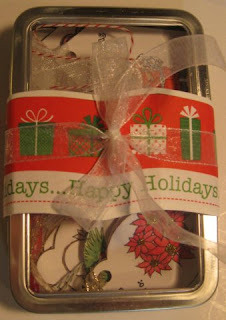 The Jingle tags are a digi freebie from Juliet’s Blog- I love these-Thanks! Our Challenge Mom Lisa gave us a sketch challenge this week. 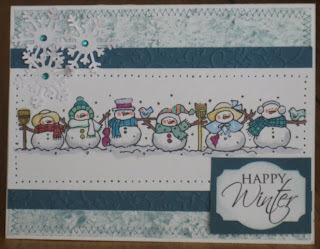 I am still making Christmas cards, and found an adorable digi by Heather Ellis –well let me re-phrase that- Heather Ellis has an Etsy store full of adorable digi images, and this is one of them…..
She is colored with Copics and I added Flower Soft and glitter to her trim. The shimmer in the background is a TJ technique called Ice Crystals- I added a little tinge of Soft Sky to the technique. 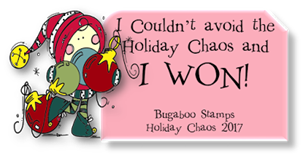 The DSP is Mind’s Eye and I had to add some tags that are a Digital Freebie on my Stampin Friend Juliet’s Blog. 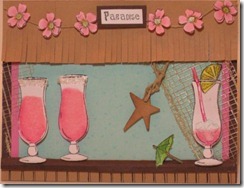 To see the other Bloggers Challenge cards, click on the link on my sidebar. I also wanted to share –what my husband does for entertainment…LOL he is fascinated by squirrels…. The squirrels were eating a hole in the side of a pumpkin on our porch- before the freeze of course- so he carved a hole in the bottom of the pumpkin and the top of the next one. Now, they are frozen together- and the squirrels climb in the pumpkin and crawl down to get seeds and seed corn my husband adds when the pumpkin seeds are gone. The squirrels are….well fed……. One more thing- there is a new blog that is posting the daily challenges and listing what the challenges are- check it out HERE at Handmade by Gem. 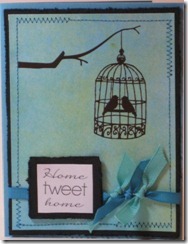 The Mid-week Throw down at the Operation Write Home Blog is Sponsored by Boni Bleaux Designs this week. There are free digital images available-humorous of course- to make cards for the man in your life. This is one of the freebie images- he reminds me of Sarge from Gomer Pyle ………..LOL The sentiment says, “I wear the pants….My wife tells me which ones”. I made the embossing folder with a Technique Junkies tutorial from the latest newsletter and sanded it exposing the white core under it. 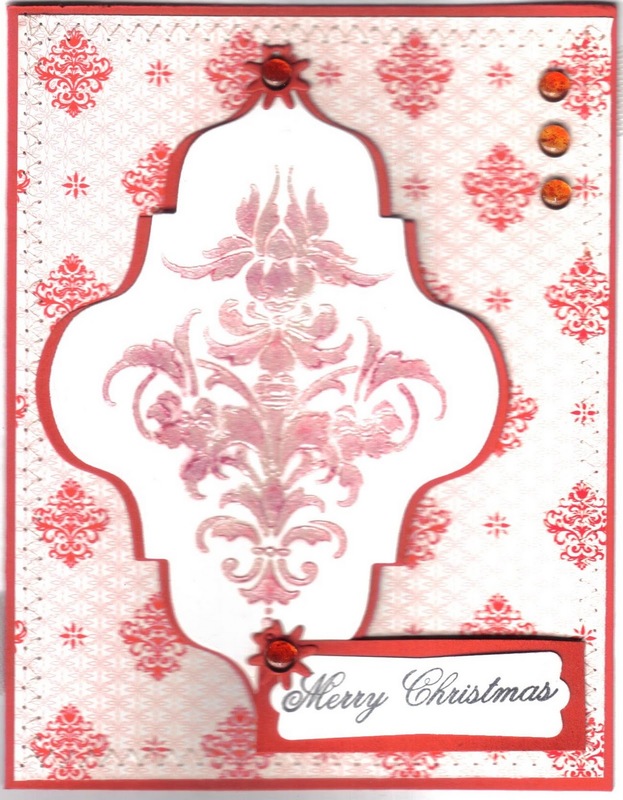 I used a die cut exclusive to Scrap Mart- and cut off the rounded sides and top……. I also colored and trimmed portions of the image and they are on dimensionals (the hat and the clothes). There is no glitter allowed on cards for soldiers, but I learned I CAN highlight with Copic Spica pens- so I did- on the star, the metal and the flagpole. The cards are better if not bulky- or the soldiers will have to pay customs fees. Boni Bleaux Designs is also having a 50% off sale tomorrow on Christmas Digi’s. There is another free digi offered HERE- for a chance to be the Guest Designer with the DT on the Dude Time Doodles Challenge Blog hosted by Boni Bleaux Designs. 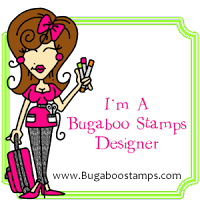 Stamps R Us has an ‘Anything Goes’ challenge going on, so I took the opportunity to play with a couple of fun images from Boni Bleaux Designs. I colored my ‘Dude’ with Copic markers, and highlighted the tree, ornaments, star and beer cans with Creative Inspirations Paint. I dude-led around the edges of my die cut, and to finish off my card, fringed the bottom layer like a rug. The sentiment is from My Favorite Things. Life is good- I bet the girls are out Christmas shopping…..or, they are in the kitchen making something delicious for dinner……. There is also a freebie available now at the Dude Time Doodles blog for a chance to be the next Guest Designer- for a month! Let me tell you, they are a very fun and energetic bunch! Entries are due by this Friday 12/17. I never leave the 1st comment on blog candy! 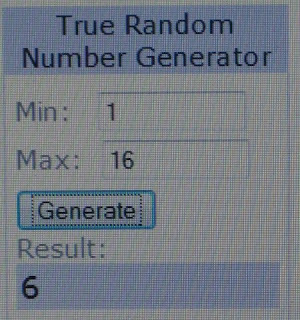 Wow- Congrats Shar- you have 48 hours to send me your address and you can go to the CI website and pick out 6 jars of CI paint. 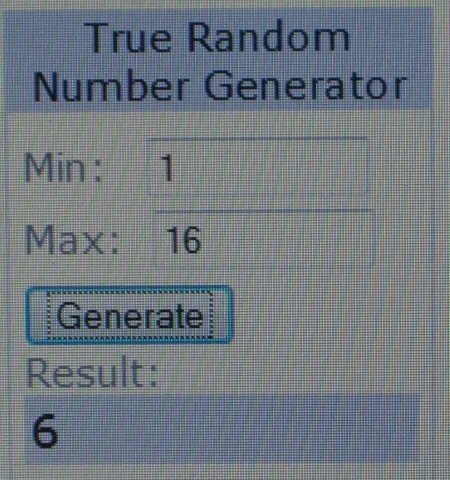 Congrats and Thanks to everyone who played along! I just wanted to post a reminder that Firecracker Designs by Pamela is closing- last day for orders is 12/15 (Wednesday). -rubber stamps priced so low she is practically givig them away! 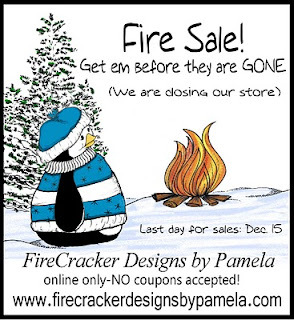 The Digital images are NOT on sale- Pamela will continue to sell Digital images. For my Creative Inspirations Paint post today, I had some fun with merging digital images. I found a tutorial HERE on Bird's Blog. 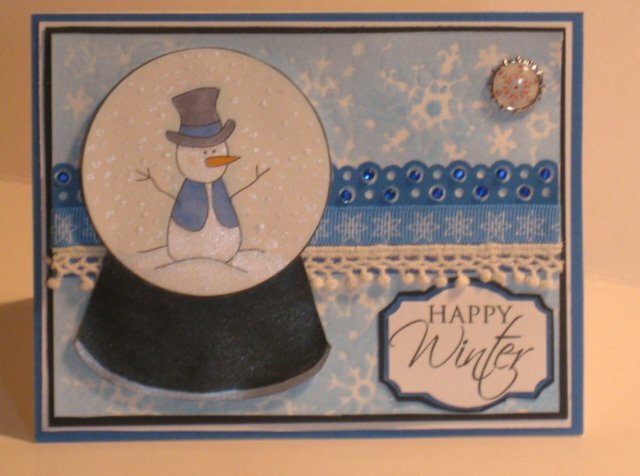 I used her Snowglobe and merged a darling snowman by Clear Dollar Stamps into it. (The snowman and the sentiment are free and the snowman comes as a line drawing and pre-colored). 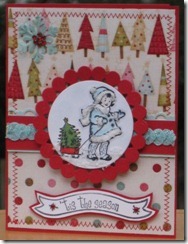 There is also a CDS challenge for December (at the CDS blog)- use three blues on a card plus use a CDS image. This card is so shimmer IRL! I took a mini-mister and Sapphire Creative Inspirations Paint and made a shimmer spray. I filled up the mini mister ~ 2/3 full with water, then added CI paint in with a paintbrush- swirled it around- when it looked like I wanted it too, I sprayed with the mini-mister over an Impressability snowflake die. I colored the image with Copic markers, then painted over that with CI paint- you can even see Copic blending under the Ci paint! I used Antique Silver and Onyx for the base of the snowglobe, then colored in the snow and snowman with Fairy Dust CI paint. (I did not color the hat, carrot or the vest). I took my aquapainter and dotted on the CI paint to mimic snowflakes. 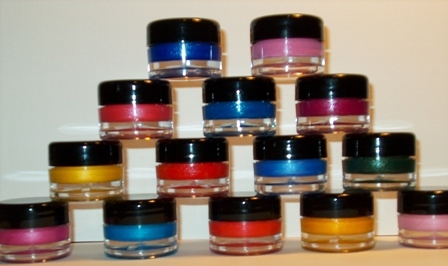 How would you like to win 6 jars of Creative Inspirations Paint- you choose the color? Just leave a comment here- and if you post this on your side bar, I will enter you twice (just stop back and let me know)! I will draw a winner on Sunday - winner will have 48 hours to contact me- so please make sure I have a way to contact you! And, if you are a follower and live outside the USA, I will gladly ship the paints to you if you win. PS- Did you know Creative Inspirations Paint has a weekly challenge- you do not have to use CI paint and there is a monthly drawing to WIN paints. 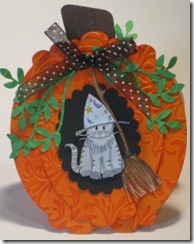 The current challenge is Inspired by a Snowglobe (Your card does not have to have a snowglobe). Also, the DT posts daily- please stop by if you have a little time and check it out! Tutorials are posted each Saturday. HERE is the direct link for the DT posts. DO you have Inspirations Paint? Please drop by and link your creations in the upper Rt corner of the blog- we'd love to be inspired by you! The snowflake stamp is from Penny Black. The Sentiment is a digi from Clear Dollar Stamps. I colored the snowflakes with Copics and highlighted the image and the snowflakes with a Copic Spica pen. I used a lonely snowflake punch and finally got to use the rhinestones I bought last winter..... The aim of the Belli blog is to use older supplies that may have been forgotten...... This background is a Technique Junkies unknown- I have no clue what the technique is- I will have to go see if I can figure it out! 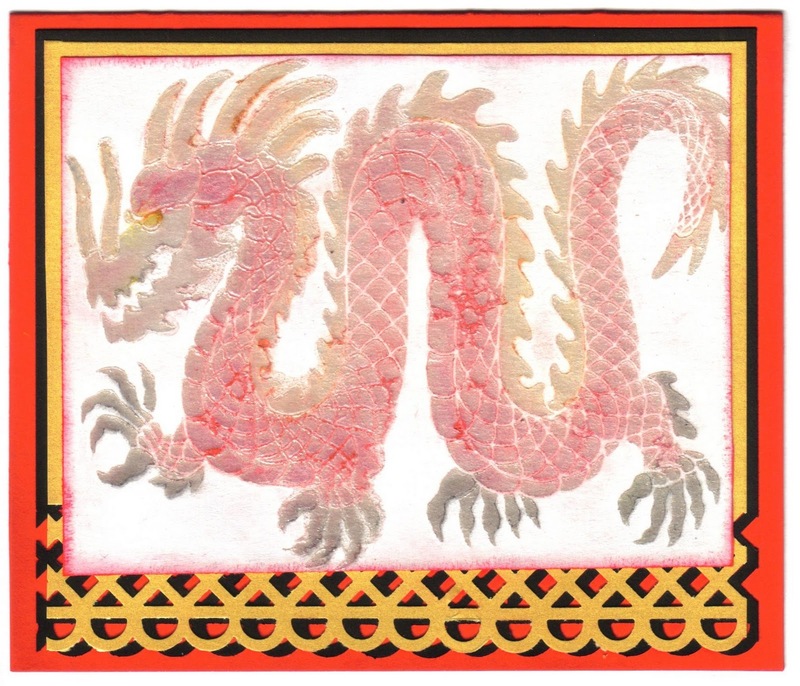 I also added machine Zig-Zag stitching around the edge of the card. Be sure to visit the Creative Belli Challenge Design Team Member's blogs to read more details about their designs. You will find lots of awesome ideas!!! If you upload a card to Splitcoast , PCP, Stamp TV or another online gallery be sure to add CBC106 in the keywords section. 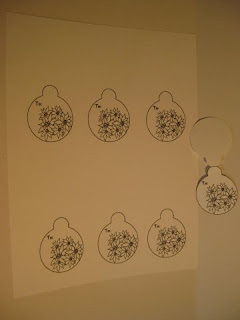 Last month, the Technique Junkies newsletter had a few tutorials for working with stencils. I have quite a few Brass Stencils and I really enjoy trying new things. Here are a couple of cards I created with my stencils. 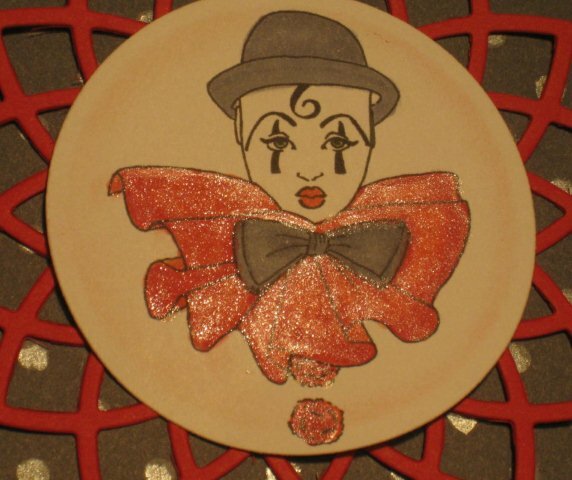 This stencil is by Dreamweaver and the Paper is from Paper Temptress. I just love that it came out because these are so many curves and notches in the design ! 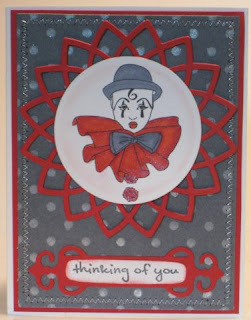 This stencil is from ACD and the sentiment is from Firecracker Designs by Pamela. The SU DSP has a very similar design. The ATC group I am a part of met for a Holiday gathering today. We had a great time. 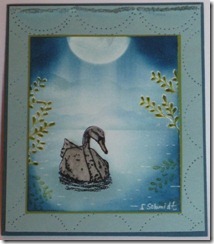 First I want to share the ATC I made for the 1-4-1 share we do each month (over and above the 12 we make to swap). ON the Fun with ATC’s blog- the challenge is a side step ATC- I used my Artistic Outpost OZ set again and a yellow TJ background for the shimmery Stair Step color. The images were all colored with Copics and the Rt side has Soft Sky sponged on-does not show too well in my photo. (The bike is AO also from another set). There is a link on the Fun with ATC site for the dimensions to make this. 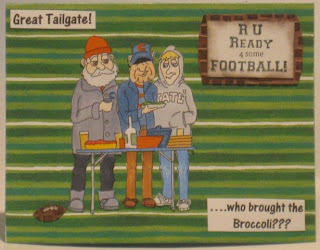 Next is my ATC for the swap- I used a Fred She Said colored digital image. 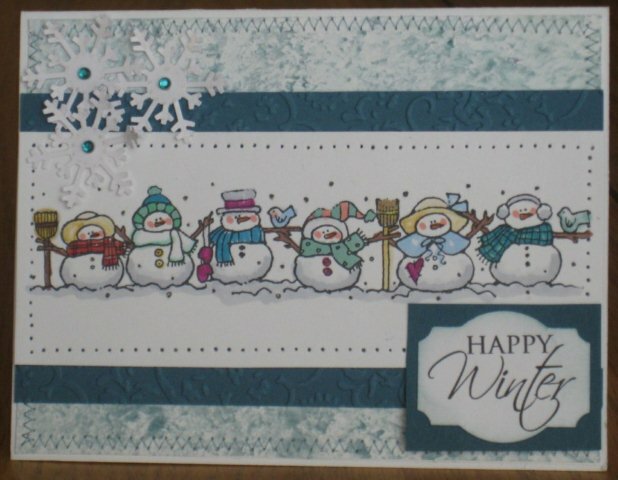 The background is embossed with the Swiss Dots folder- I think it mimics snow…..
By Diane M- the one on the right is the special 1-4-1 and it is an ATC that opens like a card. The fish is on Acetate, colored with pearl pens. There is a dimensional that pops up the fish and the BG looks like it is underwater- there are fibers inside and the back of the acetate has stickles or glitter on it. Way cool IRL!